In 2016 Maruti's big play is their just launched SUV, the Vitara Brezza. It's a compact SUV, under 4-metres in length and is positioned between the Mahindra TUV300 and the Ford EcoSport. 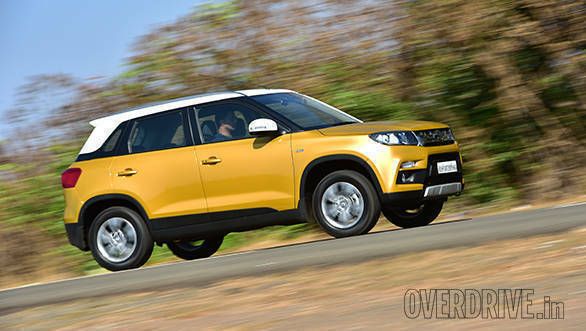 Here then is the full road test review of the Maruti Suzuki Vitara Brezza. The Maruti Suzuki Vitara Brezza is a handsome vehicle, there is no denying the strong lines and stance it adopts. However make no mistake this is more crossover than SUV and despite the 'tall' claims, the Vitara Brezza almost resembles a hatchback, albeit a very large one. Its character strangely enough comes not from its tallish stance but from its width accentuated by that slim and very wide grille that flows smoothly from headlamp to headlamp. Even the ornamentation, like the slim daytime running LEDs accentuate the width of the Vitara Brezza. The front end is undoubtedly the most attractive profile of the Vitara Brezza. In fact, the front looks more like one big bumper with a large air dam and dinner plate sized fog lamp and indicator inserts commanding attention. Another aspect that makes it stand out distinctly is the length, and you have to hand it to Maruti, the design is so clever the Vitara Brezza just does not feel like it's under 4-metre in length. Ground clearance is a reasonable 198mm which means you have enough room to hurdle large obstacles in urban areas and enough if you do decide to tread mildly off road! The 16-inch wheels and tyres do a decent job of filling out the wheel arches and giving the side profile a fuller appearance. The side profile of the Maruti Suzuki Vitara Brezza is probably the dullest profile but a unique highlight gives it an edge over others in the segment. That highlight is the white almost floating roof. Almost floating because the roof appears to extend into the D-Pillar and the white paint effect continues into that area. There are other variants without the white roof and the floating effect is more visible in those. Nonetheless the white roof in the ZDi + dual tone variant we were driving superbly complements its second tone, a soft golden hue. Even the wing mirrors have been pained white to carry forward the dual tone theme. Max length is just 3,995mm while height stands at 1,640mm and max width is a generous 1,790mm. The 2,500mm wheelbase also reveals just how close the wheels are placed to the edges, and a side profile clearly shows the short overhangs both front and rear. At 1,530mm front and 1,505mm rear, the track is also substantially wide to enhance interior space and give it, on paper, the right spec for stable dynamics. At the rear, the spoiler, the chrome boot handle and the chunky bumper with the silver scuff plate make that end look busy and yet attractive. 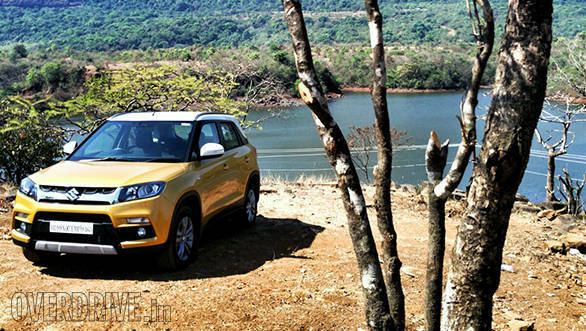 Step inside the Maruti Suzuki Vitara Brezza and what greeted me is a familiar sight. 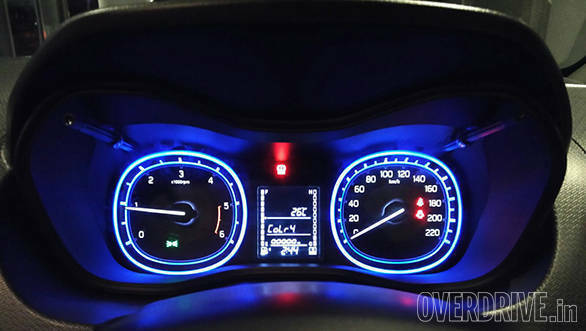 The dashboard is an almost straight lift off from the Baleno, which is not a bad thing since it is a well executed and clean layout. For those not familiar with the Baleno layout, the only differences in the Vitara Brezza are the piano black mirror finished bezels surrounding the infotainment system and the air con vents and the rake of the dashboard which feels less steep in the Baleno. Another interesting aspect is that, the S-Cross, Baleno and the Vitara Brezza all sport different multi information displays wedged in between the speedo and tachometer. I found the Baleno multi info display to have the most interesting stuff with performance and assorted data displayed whereas the Vitara Brezza's is simpler. 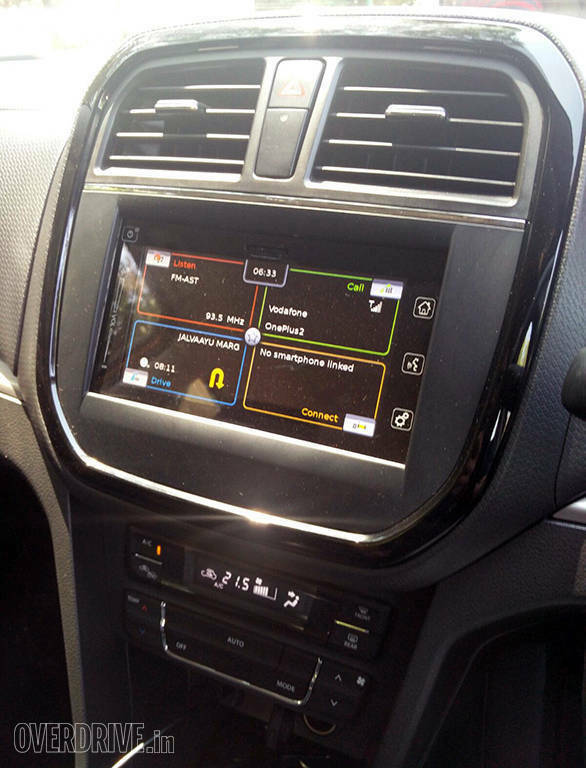 The steering wheel you see in the images shows the audio controls, phone activation controls and cruise control switches. The latter is a first in this segment and should set off a trend though its only available in the ZDi+ variant. 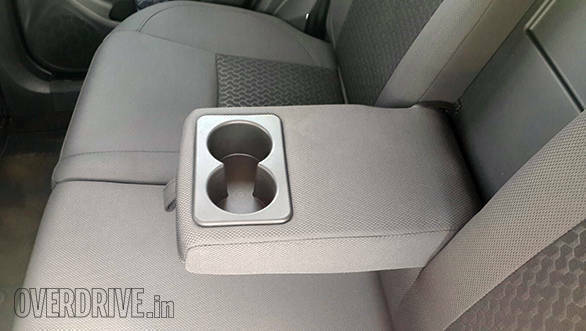 Space and storage areas are another big plus in the Maruti Vitara Brezza. The rear bench, where the width and the wide track come into play, has generous knee room and can easily seat three passengers. The boot volume stands at 328 litres with the rear seats folded up. This isnt hugely generous but the layout of the boot with a full flat loading area and easy access give it an advantage. Fold the 60:40 split rear seats down and you can expand boot volume significantly. Apart from the native space, you also get several storage features, dual gloveboxes, bottle holders all around and several more areas where you can store all sorts of things. Comfort is also a key area and while Suresh felt the seats in the Vitara Brezza were a bit too firm, I know these work better over time. The firmer seats wear their shape, density and firmness for a longer period of time and are also more comfortable over longer distances. My one grouse is with the graphic on the upholstery and the plastic panels. Maruti have attempted to go after a carbon fibre-like finish but it's not smart and a simpler, subtle and less textured effect may have worked better. The Maruti Suzuki Vitara Brezza is based on an all-new C platform. Kerb weight is a maximum 1195kg. The positives of this chassis are its stiffness and the strength that provides to the Vitara Brezza. This is a hugely satisfying chassis and it provides the SUV with more secuity, stability and peaceful driving experience. I especially like how the entire setup feels very European, down to the firm ride control. The MacPherson struts up front and the torison beam at the rear are stiffly sprung so in both urban and rural areas you get superb ride quality. Almost as good if not better, than the Ford Ecosport. 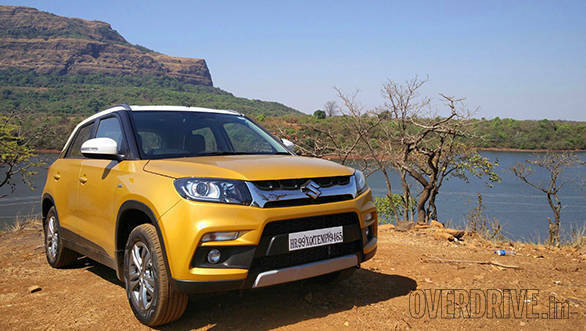 In fact the Maruti Vitara Brezza is so well damped it superbly mixes up both comfortable driving when you need it while also providing stable dynamics when you feel the need to get a bit more aggro! However if outright driving fun is what you are interested in, then the Baleno is better suited to that character. The Maruti Suzuki Vitara Brezza feels more capable and luxurious and is better rounded off to apply itself as a family car. There is minimal body roll, it is superbly controlled around corners and there is very little that will upset it, just bear in mind this isn't a hot hatch! The front wheel drive is also tuned to understeer for safety reasons, so hard cornering will result in the front end screeching hard before it breaks away. 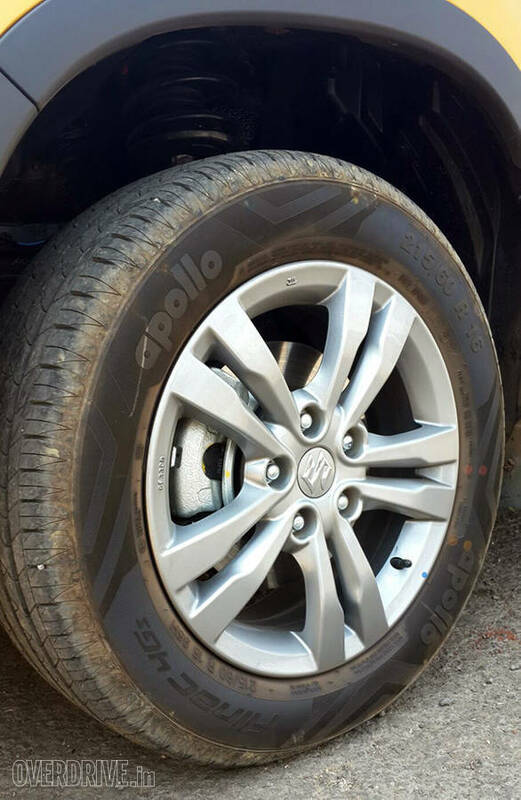 The Vitara Brezza comes shod with Apollo Alnacs, 215/60 R16s and these are a decent set of rubber. They are fantastic at damping and also enhance the stability. The steering is light but also nicely weighted at speed. Its accurate, at least as accurate as electrically assisted units are but lacks feedback. For an SUV however there is little that gets transmitted to the steering wheel and that's an aspect that provides a lot of confidence and security especially if you're on a highway, at speed and encounter an unexpected bad patch. 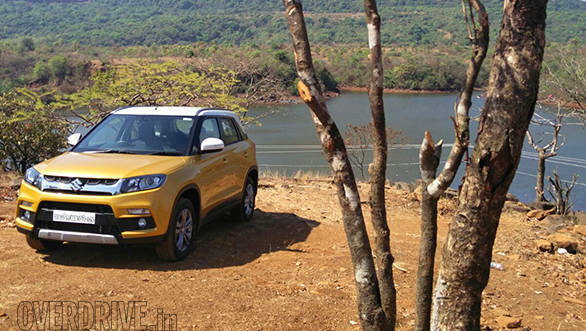 The Maruti Suzuki Vitara Brezza will continue to hold its line and exhibit no jumpiness. 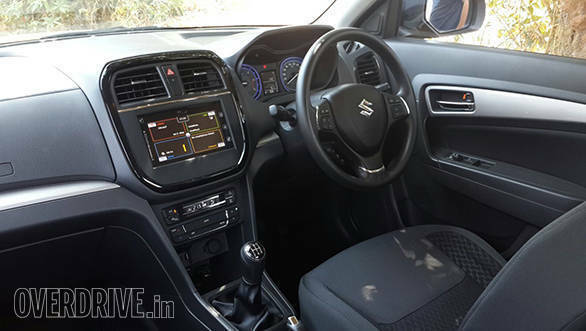 The one thing I did not like though and this also exists in other Maruti models is the thin reedy steering wheel. To complement a SUV, a slightly fatter, chunkier to grip steering wheel would have fit the mood set in this SUV. Under the Vitara Brezza's hood lies the unassuming 4-cylinder 1248cc turbocharged diesel mated to a 5-speed manual transmission that's the mainstay of the Maruti fleet. This engine serves several cars in their fleet and is a competent, efficient and relaxed performer. Making a max 90PS of power and a respectable 200Nm of max torque gives it the competency to handle any situation with a full load of passengers and luggage. There have been doubts voiced by several people as to the capability of this engine and I can now report that those doubts can be laid to rest. It however has its advantages and drawbacks. The advantages the Vitara Brezza's engine offers are good fuel efficiency, as I write this, I achieved a fuel economy of 17.9kmpl on the highway driving at a steady 100kmph. Had I to drop this speed to an average 80kmph, that efficiency figure would have hiked north significantly, easily leading up to or at least close to Maruti's claimed 24.3kmpl overall. I have yet to test the city mileage but I have no doubts it will be impressive. Another advantage this engine has to offer is its refinement and strong mid range torque spread. There is little to no engine noise or vibration that you can feel inside the cabin at any speeds. The mid range torque spread is also another strong asset. However the Vitara Brezza does have a bit of a weak spot especially the low down torque and high rev grunt. What this results in are more gear changes as the loads on the engine increase. So while the Vitara Brezza will comfortably crawl in traffic in second and third gear, you will on occasion feel the need to shift down a gear and get back in the powerband, even though the max torque kicks in at 1,750rpm. You may also feel the need to downshift constantly on uphill sections where the engine does run out steam. In gear acceleration clearly indicates the strong mid range, though as you move into 5th gear the weak bottom is highly pronounced, better to overtake by simply shifting down a gear and let the torque surge sweep you past slower traffic. The engine revs max out at 5,500rpm though the tachometer is redlined from 5,000rpm onwards. A light clutch pedal makes the driving experience much nicer and at no time do you feel like you need to ride the clutch to get the torque flowing. Overall though this diesel is smooth and effortless and the slick shift quality adds to the driving pleasure. The transmission is also what gives it respectably quick acceleration times - on my test runs it sped to a 100kmph in 13.8 seconds maxing out at a top speed of 169kmph with the speedo reading out around 175kmph. Braking is confident. 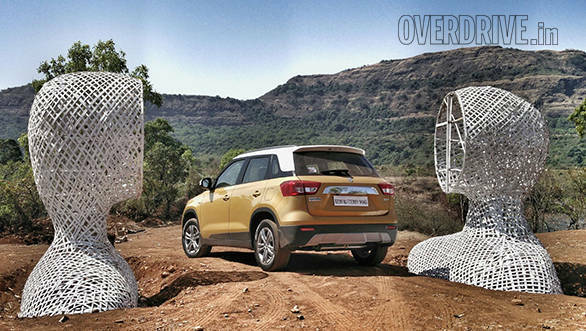 The Maruti Suzuki Vitara Brezza comes to a halt from 100kmph in just 43 metres without any antics. For a 4-cylinder diesel lugging around close to 1360kgs, it's competent. If you're looking out for a more thrilling experience, as I mentioned earlier, shop for the Maruti Baleno. One area Maruti was lagging behind Hyundai used to be the feature set they offered on their products. The Baleno was the first to move the game ahead for Maruti and the Vitara Brezza aims to carry that advantage further. 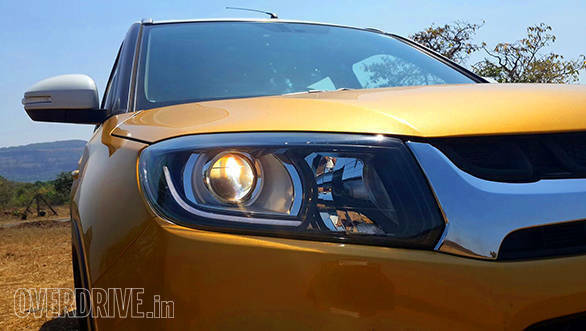 On the outside apart from the two tone finishes and the projector lamps with the LED DRLs you also get a host of customisable options bracketed under three distinct types: Glamour, Urban and Sporty. You also get rain sensing wipers and automatic headlamps as well as a reverse parking camera with guidance markers. Inside the cabin I did like the cooled upper glovebox and the six-colour options for the instrument binnacle which lights up the speedo and tacho from white to silver to reds and blues. Maruti continues to offer CarPlay, compatible with both Android as well as iOS. On the safety front, driver airbag is standard across the range while passenger airbags are an option. ABS is also standard across the range though there is no ESP or traction control. Hopefully that should begin making an appearance in the future. Maruti for the first time has also incorporated cruise control, though I seldom see it being used in India given our traffic conditions both in the city and on the highways. Then there are several other features that are slowly becoming par for the course such as bag and coat hangers, multiple charging points, etc. One feature I would have liked to see would have been a telescopic steering wheel. Maruti continues to offer tilt settings but telescopic will be a benefit for various body types. Maruti clearly has a winner on their hands, that was apparent the day they announced their pricing. Kicking off from Rs 6.99 lakh for the base LDi variant moving up to the Rs 9.68 lakh for the top of the line ZDi with all the options is a very attractive sticker. However the lack of a petrol from the time of launch may be a hard pill to swallow for customers who want that drivetrain specifically. 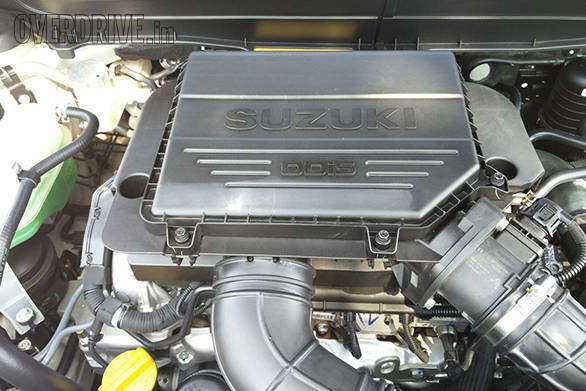 Of course Maruti does not yet have a petrol powerplant that could complement the Vitara Brezza but it's coming. Maruti will retail the Vitara Brezza through its network and not under the Nexa umbrella. That is a sensible move but the Baleno has also shown us that in its case even Nexa with its lesser geographic spread cannot hold a good car down. However the strategy has also set tongues wagging - why is the Vitara Brezza not in the Nexa pipeline while the Baleno is, even though the latter is less expensive? I guess those questions will remain unanswered. Nonetheless I do have the confidence to say that Maruti have done enough in the Vitara Brezza but I also believe there is lots more they could have done. I also get the sense that we haven't yet seen all there is to see. 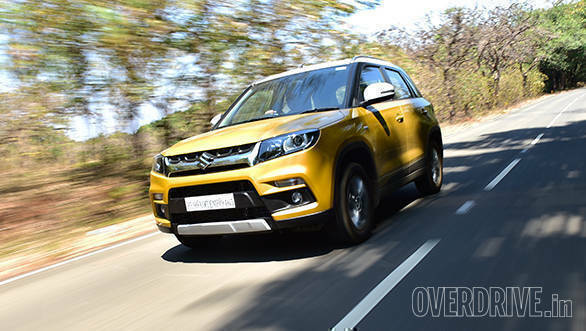 As it is for now, the Vitara Brezza is easily one of the finest Maruti has produced. I'd highly recommend it to all those looking for a confident, stylish and contemporary family mover. 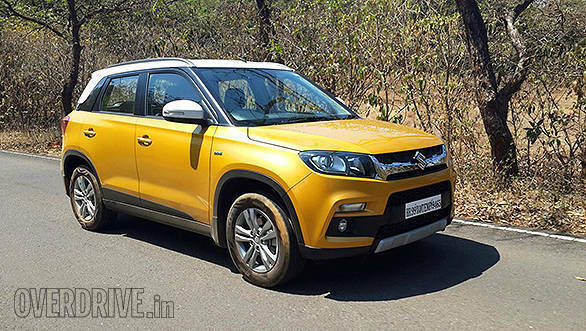 Even for individuals not looking for a very sporty character, and yes despite all that Maruti claims, the Vitara Brezza does not have that much of a sporty character, I'd say go for it. It's the 'in thing' for the moment and you'd be very fine in it!